It's better to introduce dogs into a cat home than the other way around. Cats and dogs usually fight like, well, cats and dogs, but you can foster harmony between them. It's better to introduce a dog into a home with a cat than the reverse. Breed disposition comes to bear, but age and early experiences are the most important factors. The potential for conflict between cats and dogs is great. Both animals are predators and enjoy hunting things that are smaller than them, which is usually bad for cats. Dogs have higher energy levels than cats, which further off-puts potential feline comrades. Furthermore, some of their body language cues conflict. Notably, when dogs turn their heads away, it signals submission, but when cats do it, it signals aggression. So it takes a certain kind of cat to warm up to dogs. Breed disposition plays a role, but cats' and dogs' nascent experiences with each, particularly as kittens and puppies, are the best potential rapport indicators. Get a cat that's less than six months old first, then get a dog that's less than a year old. That's the ideal path to fostering a successful cat and dog home, according to research at Tel Aviv University reported in 2008. Successful doesn't necessarily mean friendly, though. About a quarter of homes in the Tel Aviv study reported indifference between cats and dogs. Aggression and fighting were observed in 10 percent of the homes. In homes were peace persisted, Tel Aviv researchers noted that cats and dogs were displaying body language typical of the other animal's species. If you have the advantage of choosing the cat in your cat-dog home, consider one with a dog-like personality.They require more socialization than other cats, but this also means they have higher potential to bond with a dog that meets these needs. According to PetMD, an online veterinary resource, the top three cats in this category are Manxes, Abyssinian and Burmese. If you have the advantage of choosing the dog in your dog-cat home, consider a smaller dog -- one who's less likely to view your cat as prey. According to Animal Planet's website, the top cat-friendly small dogs are Bichon Frise, Japanese chins, Shetland sheepdogs, Chinese crested, Boston terriers, Cavalier King Charles spaniels, Malteses, chihuahuas, Shih Tzus and Pomeranians. 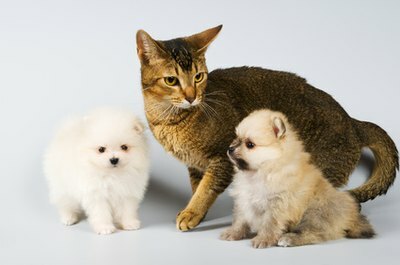 Regardless of order and age, a good introduction is necessary to solidify cat-dog camaraderie. Cats prefer to evaluate dogs from a height because it makes them feel safe. As such, make sure your cat can reach multiple safe spaces in a room where you plan early meetings. Leash the dog and allow the animals to sniff each other. Cats appear to hold nastier grudges than dogs, so protecting your cat is the first order of business. Feeding the animals in close proximity helps develop positive associations among pets, or, at the very least, tolerance. Clicker training can reinforce these associations. Clickertraining.com: Can Cats and Dogs Be Friends? American Society for the Prevention of Cruelty to Animals: Can Cats and Dogs Get Along? University of California Santa Barbara ScienceLine: Why Do Cats and Dogs Not Get Along? Do Akitas & Cats Get Along?